Introduction, Christopher Gane and Robin Hui Huang. Part I Theoretical Framework: Getting back to our roots: global law schools in local context, Kate Galloway; Global challenges to legal education, John Flood; The bifurcation of legal education - national vs transnational, Hans-Wolfgang Micklitz; Learning opportunities in multi-national law school classes: potential and pitfalls, Carolyn Evans; Doctrine, perspectives, and skills for global practice, Simon Chesterman; Cultivating high-quality internationalized legal talents under legal globalization, Liu Xiaohong. Part II Shifts in Teaching Philosophies and Methods: The values dimension of legal education: educating for justice and service, Paul Redmond; Critique, philosophy, and the legally-trained citizen’s role in working towards just institutions, Seow Hon Tan; Rethinking teaching, learning and assessment in the twenty-first century law curriculum, Rick Glofcheski; The unfulfilled promise of law schools to prepare students for the practice of law: an empirical study demonstrating the effectiveness of general law school curriculum in preparing lawyers for the practice of law, John Sonsteng with Leigha Lattner, Emily Parks and David Camarotto; Integrating the idea of global governance and international collaboration into law school education, Shi Yan’an; Navigating e-spaces in legal education and legal practice, Rita Shackel. Part III International Experiences: The case of the common law in European legal education, Avrom Sherr; The challenge of massive open online courses (MOOCs) to traditional legal education: the Australian experience, Joellen Riley; The structure, purposes and methods of German legal education, Rainer Wernsmann; Reforming Taiwan’s legal education in the age of globalization, Ming-Yan Shieh and Yen-Chia Chen; Globalization and legal education in China today, Wang Zhenmin; The ideal and path of legal education reform in China, Ji Weidong; Legal education in the global context: the case of Hong Kong, Johannes M.M. Chan. Index. Christopher Gane is Dean at the Faculty of Law, Chinese University of Hong Kong. His research and teaching interests include domestic Criminal Law and Procedure, International Criminal Law and Human Rights. He is author of twelve books and more than fifty scholarly articles and papers. 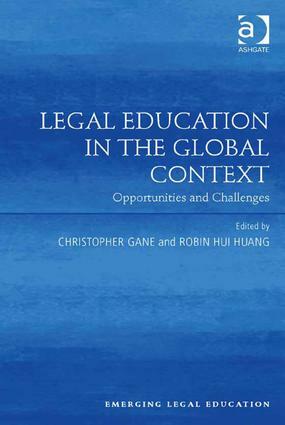 Robin Hui Huang is a Professor of Law at the Chinese University of Hong Kong. He specializes in corporate law, securities regulation, financial law, financial dispute resolution, and foreign investment, with a particular focus on Chinese and comparative law issues. He has held visiting posts at prestigious institutions including Harvard Law School and Cambridge Law School, and has been engaged as an expert by international organizations such as the World Bank.